SLOVIANSK, May 02. /ITAR-TASS/. Ukrainian army helicopter gunships delivered strikes at massive gatherings of civilians in the eastern Ukrainian city of Sloviansk, a city resident said on Friday. “Helicopter gunships have made several attack runs and delivered strikes,” the eyewitness said. Sloviansk people’s mayor Vyacheslav Ponomarev has made a video address to local residents earlier in the day asking children, women and pensioners not to leave their homes and asked men to “give all their aid” to policemen. 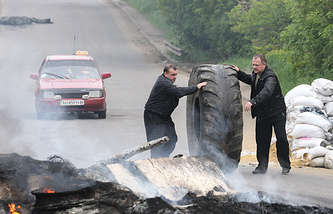 Ponomarev’s address to Sloviansk residents was delivered shortly after local residents started making a live shield on the roads leading to the city and near checkpoints to prevent Ukrainian law enforcement columns from entering the city. Ponomarev also noted that one person was killed and another one was wounded in the military strikes on the city. 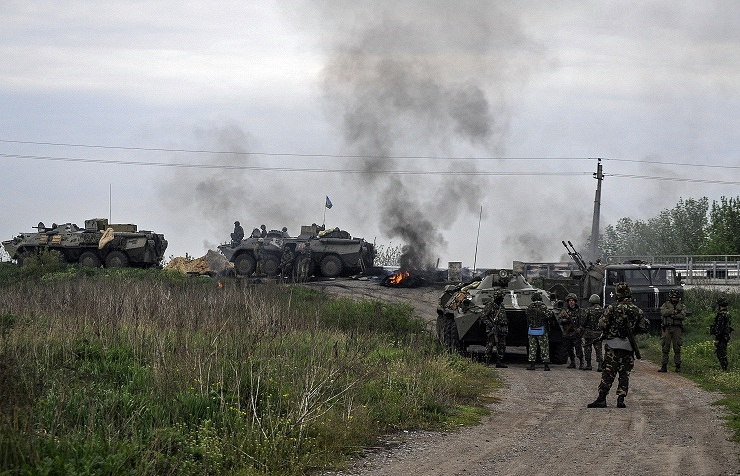 Ukrainian special forces have started a punitive operation in the city of Sloviansk early on Friday morning. “A full sweep operation was launched” with armoured vehicles and warplanes involved in it, a representative of the city militia told ITAR-TASS. The Ukrainian Defense Ministry stated that two Ukrainian Air Force’s helicopter gunships Mil Mi-24 had been downed and a military transport helicopter Mi-8 had been damaged in clashes. Three people, including two servicemen and a militiaman were reported killed. 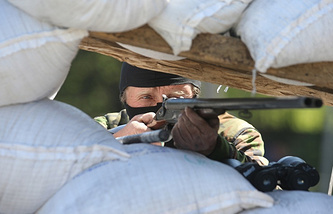 Earlier, Ukrainian Security Service’s anti-terrorism centre reported about “the gunfire at a third helicopter gunship” which participated in a special operation in the eastern Ukrainian city of Sloviansk, the country’s security service stated at its website on Friday. “A person was wounded” in the gunfire. The country’s Security Service also claimed that “nine checkpoints were taken under control on the outskirts of Sloviansk. Clashes between police and federalization supporters began near the prosecutor’s office in Donetsk May 1. Law enforcement officers lined up with shields before the building amid stones and smoke grenades thrown at them. Earlier, the supporters of proclaimed Donetsk People’s Republic stated that the prosecutor’s office backs Kiev authorities and expressed their intention to voice protest. Thousands of people in the southern Ukrainian city of Odessa marched through its central streets on Thursday, May 1, carrying placards that read “Odessa Is a Hero City”, “Referendum” and “Fascism Won’t Pass”. “This will allow starting a real process of de-escalation,” the Russian Foreign Ministry stated. “It is needed to organize immediately a really full-fledged political dialogue with all regions involved to work out generally acceptable agreements about the future of the country and not to try to imitate reforms in a narrow circle of the self-proclaimed “coalition of winners,” the Russian diplomatic agency said.